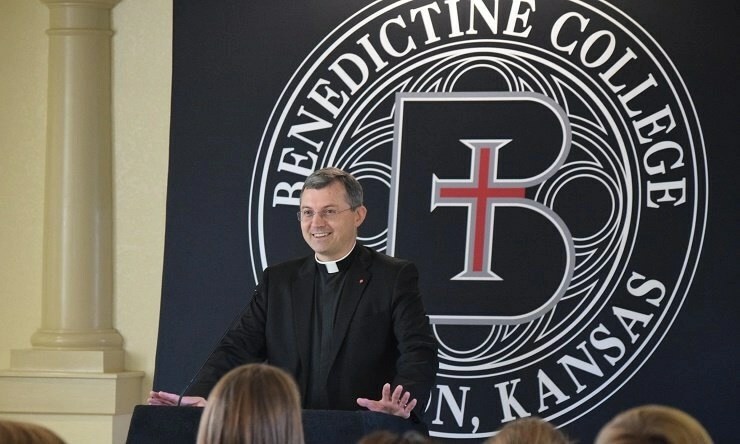 The Vatican official is the latest speaker in the campus’s yearlong celebration of the Century of Science. The college began offering science degrees in 1916, built a new Science Hall 50 years later and this fall breaks ground on a new state-of-the-art science facility. Msgr. Trafny said scientists tend to look at their research from a very narrow perspective, not thinking about philosophical or theological implications. On top of that, he said that much of the world is not Catholic or Christian, and scientists with that background don’t even have the same religious framework. He noted that scientists are often surprised when his office contacts them, because they had no idea they were potentially crossing moral or ethical lines. He said it is important for them to engage with the scientific world and he was quick to point out that engagement did not mean approval, it just opened the door for dialogue. He also noted that scientists today are often working on only one part of a research project, rather than developing the entire project as was customary in the past. President Minnis sees advancement in STEM disciplines as central to the college’s faith-based mission. Msgr. Trafny was born in Darłowo, Poland in 1970. He completed his studies in Philosophy and Theology at the Catholic University of Lublin and was ordained a priest in 1996. He served as a parish assistant for the Archdiocese of Lublin, and then as a chaplain at the Medical University of Lublin and the Hospice for Terminally Ill. He continued his post-graduate studies in Philosophy at the Catholic University of Lublin and the Pontifical Lateran University in Rome. He has served on the Pontifical Council for Culture as head of the Science and Faith Department and as executive director of the Science, Theology and the Ontological Quest (STOQ) Project and as director of the STOQ Research Series. In 2013, he became Secretary of the Scientific Committee of the Science and Faith Program at the STOQ Foundation and in 2014 he became a member of the Advisory Board of the John Templeton Foundation. He is a co-author of the book The Healing Cell: How the Greatest Revolution in Medicine is Changing Your Life with Dr. Robin Smith and Dr. Max Gomez. The book was released in the United States in 2013. His focus is on matters related to the wide-ranging dialogue between science and religion, especially cultural analysis of scientific advancements, but his interests also include philosophy and theology of nature as well as environmental and climate change issues.